A complete copy of these rules can be obtained at the offices of radio station 95.1 KBBY (“Station”), owned and operated by Cumulus Media Holdings Inc. or one of its subsidiary companies, 1376 Walter Street, Suite 6, Ventura, CA 93003 during normal business hours Monday through Friday or by sending a self-addressed, stamped envelope to the above address. This Contest is open only to legal U.S. residents age eighteen (18) years or older at the time of entry with a valid Social Security number and who reside in the Station’s Designated Market Area (“DMA”) as defined by Nielsen Audio, who have not won a prize from the station in the last 90 days or a prize valued at $500 or more in the last 180 days, and whose immediate family members or household members have not won a prize from the station in the last 90 days or a prize valued at $500 or more in the last 180 days. Void where prohibited by law. Employees of Cumulus Media Holdings Inc., its parent company, affiliates, related entities and subsidiaries, promotional sponsors, prize providers, advertising agencies, other radio stations serving the Station’s DMA, and the immediate family members and household members of all such employees are not eligible to participate. The term “immediate family members” includes spouses, parents and step-parents, siblings and step-siblings, and children and stepchildren. The term “household members” refers to people who share the same residence at least three (3) months out of the year. The Contest is subject to all applicable federal, state and local laws and regulations. Participation constitutes entrant’s full and unconditional agreement to these Official Rules and Sponsor’s decisions, which are final and binding in all matters related to the Contest. Winning a prize is contingent upon fulfilling all requirements set forth herein. Contest Period. The Contest will begin at 12:01AM PT on April 4th, 2019 and will run through 7:00PM PT on June 20th, 2019. The Station’s computer is the official time keeping device for this Contest. Online: Visit the Station’s website at www.951kbby.com, during the Contest Period, click on the “Contest” link, designated as the “Free Lunch Friday” Contest link, and complete an entry form. All entries must be received by 11:59 pm PT on June 20th, 2019 to be eligible to win our weekly prize drawing. Limit one (1) entry per person, per day, per email address. Multiple participants are not permitted to share the same email address. Any attempt by any participant to submit more than one (1) entry per day by using multiple/different email addresses, identities, registrations and logins, or any other methods will void that entry and the participant may be disqualified. Use of any automated system to participate is prohibited and will result in disqualification. Station is not responsible for lost, late, incomplete, invalid, unintelligible, inappropriate or misdirected registrations, all of which will be disqualified. In the event of a dispute as to any registration, the authorized account holder of the email address used to register will be deemed to be the participant. The “authorized account holder” is the natural person assigned the telephone number by the wireless carrier or an email address by an Internet access provider, online service provider or other organization responsible for assigning email addresses for the domain associated with the submitted address. Potential winner may be required to show proof of being the authorized account holder. All entries become the sole and exclusive property of Station and will not be returned. Station reserves the right to contact entrants and all other individuals whose email address is submitted as part of this promotion. No mail-in entries will be accepted. Winner Selection. 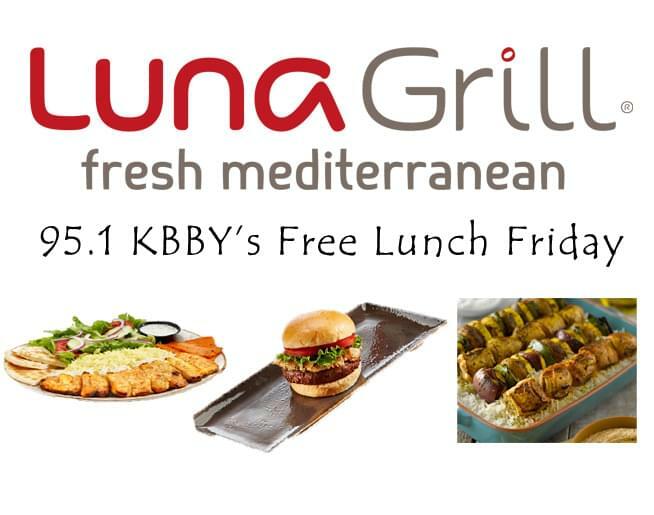 On or about 12:00 Noon PT, on each Friday during the Contest Period, Station will select (1) one entry to win one (1) catered lunch to be provided by and delivered to the winner’s place of employment by Luna Grill of Ventura County on the Friday following selection during the Contest Period. Prizes to be awarded in a random drawing from among all valid entries received by Station during the Contest Period. The winning entrants will be contacted using the email address and/or telephone number provided with the entry and may be awarded the prize (subject to verification of eligibility and compliance with the terms of these rules). Winning entry must get permission from their supervisor for the radio station to be on site with the radio station van, radio station branded tent, and for the Luna Grill catering staff to deliver, prepare and supervise lunch on the assigned day, and at the assigned time of 11:45AM to no later than 1:00PM PT, the Friday following their selection as the winning entry for that week. Failure to obtain the necessary permission will void winner’s eligibility. Station’s decisions as to the administration and operation of the Contest and the selection of the potential winner are final and binding in all matters related to the Contest. Failure to respond to the initial verification contact within one (1) day of notification will result in disqualification. Verification of Potential Winner. THE ELIGIBILITY OF POTENTIAL CONTEST WINNERS IS SUBJECT TO VERIFICATION BY STATION WHOSE DECISIONS ARE FINAL AND BINDING IN ALL MATTERS RELATED TO THE CONTEST. The potential winner must continue to comply with all terms and conditions of these Official Rules, and winning is contingent upon fulfilling all requirements. The potential winner may be notified by email and/or telephone call when to pick up their prize. The potential winner will be required to sign and return to Station, within three (3) days of the date notice is sent, an affidavit of eligibility and a liability/publicity release (except where prohibited) in order to claim his/her prize, if applicable. A winner who returns the affidavit of eligibility and liability/publicity release will be deemed to have accepted the contest prize and thereafter will not be permitted to rescind their acceptance of the prize and/or return the prize. If a potential winner cannot be contacted, fails to sign and return the affidavit of eligibility and/or the liability/publicity release within the required time period (if applicable), or if the prize or prize notification is returned as undeliverable, potential winner forfeits prize. In the event that the potential winner of a prize is disqualified for any reason, Station may award the applicable prize to an alternate winner by random drawing from among all remaining eligible entries. There will be a total of up to twelve (12) prizes awarded during the Contest. Each Prize will be one catered lunch from Luna Grill of Ventura Grill, 5752 Telephone Rd, Suite A1, Ventura, CA 93003. Items to be included in the prize lunch will be determined at the sole discretion of Luna Grill. ARV of each prize is two hundred fifty dollars ($250.00). PRIZE IS NON-TRANSFERABLE AND MAY NOT BE SOLD FOR ANY REASON. Winner is responsible for all taxes, tips and gratuities associated with prize receipt and/or use. Odds of winning the Prize depend on a number of factors including the number of eligible entries received during the Contest Period and listeners participating at any given time. A complete copy of these rules can be obtained at the offices of any of the 21 participating radio stations set forth below in Exhibit A (individually a “Participating Station” and collectively, the “Participating Stations”), owned or operated by Cumulus Media New Holdings Inc. (“Station”) or one of its subsidiaries during normal business hours Monday through Friday, or by sending a self-addressed, stamped envelope to the address at the bottom of these contest rules, located below. The Station will conduct the Cumulus Media Radio Station Group Nationwide Contest “Mariah Carey Fly Away” (the “Contest”) substantially as described in these rules. Eligibility. This Nationwide Contest is open only to individuals who are (a) legal U.S. residents of the 50 contiguous states of the United States, (b) who are age twenty one (21) or older at the time of entry with a valid Social Security number, and (c) who reside in a participating Station’s Designated Market Area (“DMA”) as defined by Nielsen Audio and listed in Exhibit A (each a “Participating Station” and collectively “Participating Stations”). Employees of the Participating Stations, Cumulus Media New Holdings, Inc., its parent company, affiliates, subsidiaries, prize providers, advertising agencies, other radio stations serving a Participating Station’s DMA, local sponsors and their employees of this Contest tied with a Participating Station, and the immediate family members and household members of all such employees are not eligible to participate. The term “immediate family members” includes spouses, parents and step-parents, siblings and step-siblings, and children and stepchildren. The term “household members” refers to people who share the same residence at least three (3) months out of the year. The Contest is subject to all applicable federal, state and local laws and regulations. Participation constitutes participant’s full and unconditional agreement to these Official Rules and Station’s decisions, which are final and binding in all matters related to the Contest. Winning a prize is contingent upon fulfilling all requirements set forth herein. Contest Period. The Contest will begin at 12:01a.m., ET on February 25th and will run through 11:59 p.m., ET on March 8, 2019 (the “Contest Period”). The Sponsor’s computer is the official time keeping device for this Contest. How to Enter. Visit the website of a Participating Station, as listed below in Exhibit A, during the Contest Period and click on the “Contest” link. Then, click on the “Mariah Carey New York City Flyaway” link and complete an entry form. All entries must be received by 11:59 p.m., ET on March 8, 2019. Limit one (1) entry form per person per day per email address during the Contest Period. Multiple participants are not permitted to share the same email address. Any attempt by any participant to submit more than one (1) Entry Form by using multiple/different email addresses, identities, registrations and logins, or any other methods will void that participant may be disqualified. Use of any automated system to participate is prohibited and will result in disqualification. Sponsor is not responsible for lost, late, incomplete, invalid, unintelligible, inappropriate or misdirected registrations, all of which will be disqualified. In the event of a dispute as to any registration, the authorized account holder of the email address used to register will be deemed to be the participant. The “authorized account holder” is the natural person assigned an email address by an Internet access provider, online service provider or other organization responsible for assigning email addresses for the domain associated with the submitted address. Potential winner may be required to show proof of being the authorized account holder. All entries become the sole and exclusive property of Sponsor and will not be returned. Sponsor reserves the right to contact entrants and all other individuals whose email address is submitted as part of this promotion. No mail-in entries will be accepted. Winner Selection. On March 9, 2019, on or after 9:00 a.m. ET, Sponsor will select one (1) entry for the Grand Prize in a random drawing from among all valid entries received from all twenty-one (21) participating Stations during the Contest Period. The winning entrant will be contacted that day using the telephone number that submitted the entry and may be awarded the prize (subject to verification of eligibility and compliance with the terms of these rules). Sponsor’s decisions as to the administration and operation of the Contest and the selection of the potential winner are final and binding in all matters related to the Contest. Failure to respond to the initial verification contact within 24 hours of notification will result in disqualification. Verification of Potential Winner. THE ELIGIBILITY OF ALL POTENTIAL CONTEST WINNER(S) IS SUBJECT TO VERIFICATION BY STATION, WHOSE DECISIONS ARE FINAL AND BINDING IN ALL MATTERS RELATED TO THE CONTEST. The potential winner must continue to comply with all terms and conditions of these Official Rules, and winning is contingent upon fulfilling all requirements. The potential winner will be notified by telephone call after the random drawing, as outlined above and subject to meeting all the requirements, as outlined above in Section 5. The potential winner will be required to sign and return to Station, within three (3) days of the date notice is sent, an affidavit of eligibility and a liability/publicity release (except where prohibited) in order to claim his/her prize, if applicable. A winner who returns the affidavit of eligibility and liability/publicity release within the required time period will be deemed to have accepted the prize and thereafter will not be permitted to rescind their acceptance of the prize and/or return the prize. If a potential winner cannot be contacted, fails to sign and return the affidavit of eligibility and/or the liability/publicity release within the required time period (if applicable), or if the prize or prize notification is returned as undeliverable, potential winner forfeits prize. In the event that the potential winner of a contest prize is disqualified for any reason, Station may award the applicable prize to an alternate winner by random drawing from among all remaining eligible entries for that particular Contest Round. Grand Prize. One (1) Grand Prize will be awarded in this Contest. The Grand Prize consists of (i) round-trip coach airfare for two (2) from winner’s closet city airport to New York City, as determined in Station’s sole discretion; (ii) two (2) nights single room double-occupancy hotel accommodations as selected by Sponsor in its sole discretion; and (iii) two (2) tickets to Mariah Carey concert at Radio City Music Hall 3/25/19 at 8:00 p.m. ARV one thousand five hundred dollars ($1,500). Winner is responsible for all transportation costs not specified in the Grand Prize, gratuities, and all taxes associated with prize receipt and/or use. Odds of winning the Grand Prize depend on a number of factors including the number of eligible entries received by all Participating Stations during the Contest Period and listeners participating at any given time. Sponsor reserves the right to substitute any listed prize for one of equal or greater value for any reason. Entry Conditions and Release. By entering, each Participant agrees to: (a) comply with and be bound by these Official Rules and the decisions of the Station, which are binding and final in all matters relating to this Contest; (b) release and hold harmless Station, Cumulus Media New Holdings, Inc., each Participating Station listed below in Exhibit A, and each of their respective subsidiaries, and affiliated companies, the prize suppliers and any other organizations responsible for Stationing, fulfilling, administering, advertising or promoting the Contest, and each of their respective past and present officers, directors, employees, agents and representatives (collectively, the “Released Parties”) from and against any and all claims, expenses, and liability, including but not limited to negligence and damages of any kind to persons and property, including but not limited to invasion of privacy (under appropriation, intrusion, public disclosure of private facts, false light in the public eye or other legal theory), defamation, slander, libel, violation of right of publicity, infringement of trademark, copyright or other intellectual property rights, property damage, or death or personal injury arising out of or relating to a participant’s entry, creation of an entry or submission of an entry, participation in the Contest, acceptance or use or misuse of prize (including any travel or activity related thereto) and/or the broadcast, exploitation or use of entry; and (c) indemnify, defend and hold harmless the Released Parties from and against any and all claims, expenses, and liabilities (including reasonable attorneys’ fees) arising out of or relating to a participant’s participation in the Contest and/or participant’s acceptance, use, non-use or misuse of the prize. Publicity. Except where prohibited by law, participation in the Contest constitutes Winner’s consent to use by the Station and its agent of winner’s name, likeness, photograph, voice, opinions and/or biographical information (including hometown and state) for promotional purposes in any media now known or hereinafter created, worldwide, in perpetuity without further payment or consideration. General Conditions. Station reserves the right to cancel, suspend and/or modify the Contest, or any part of it, if any fraud, technical failures or any other factor beyond Station’s reasonable control impairs the integrity or proper functioning of the Contest, as determined by Station in its sole discretion. Station reserves the right to preempt, cancel, suspend and/or modify the Contest, or any part of it, due to a matter of local, state, national, or international importance, as determined in Station’s sole discretion, and in accordance with FCC regulations. Station reserves the right in its sole discretion to disqualify any individual it finds to be tampering with the entry process or the operation of the Contest or to be acting in violation of these Official Rules or acting in an unsportsmanlike or disruptive manner. Any attempt by any person to deliberately undermine the legitimate operation of the Contest may be a violation of criminal and civil law, and, should such an attempt be made, Station reserves the right to seek damages from any such person to the fullest extent permitted by law. Station’s failure to enforce any term of these Official Rules shall not constitute a waiver of that provision. Limitations of Liability. The Released Parties are not responsible for: (1) any incorrect or inaccurate information, whether caused by Station, participants, entrants, printing errors or by any of the equipment or programming associated with or utilized in the Contest; (2) technical failures of any kind, including but not limited to malfunctions, interruptions, delays in entry or participation in the Contest due to the text receiving system reaching or nearing capacity, disconnections in telephone lines or network hardware or software and/or failures of any kind of a Participant’s mobile service; (3) unauthorized human intervention in any part of the entry process or the Contest, including no obligation, liability, or responsibility whatsoever if individuals who do not listen to a Participating Station receive the Secret Keyword(s) from third parties such as other listeners or from any other source; (4) technical or human error which may occur in the administration of the Contest or the processing of entries; or (5) any injury or damage to persons or property which may be caused, directly or indirectly, in whole or in part, from Participant’s participation in the Contest or receipt or use, non-use or misuse of any prize. No more than the stated number of prizes will be awarded. In event that a production, technical, programming or other error causes more than stated number of prizes as set forth in these Official Rules to be claimed, Station reserves the right to award only the stated number of prizes by a random drawing among all legitimate, unawarded, eligible prize claims. Changes to the Contest or Changes to those Participating Stations. If, for any reason, in the sole opinion of Station, this Contest is not capable of running as planned by reason of an Act of God, infection by computer virus, worms, bugs, tampering, hacking, unauthorized intervention, fraud, technical failures, system overload or any other causes, whether discovered or suspected by Station, which, in the sole opinion of the Station, does or could corrupt or affect the administration, security, fairness, integrity or proper conduct of this Contest or any Contest Round(s), Station reserves the right, at its sole discretion, to cancel, terminate, modify or suspend this Contest and/or Contest Round(s), and/or provide alternative means of entry or any other changes to these contest rules that Station deems appropriate under the circumstances. In the event of termination, suspension or modification of this Contest and/or Contest Round(s), a notice will be posted online on a Participating Station’s website, as listed below in Exhibit A, and/or announced on-air for those Participating Stations who are no longer conducting the Contest and/or participating in a Contest Round. Disputes. Participant agrees that: (i) any and all disputes, claims and causes of action arising out of or connected with this Contest, or any prizes awarded shall be resolved individually, without resort to any form of class action; (ii) any and all disputes, claims and causes of action arising out of or connected with this Contest, or any prizes awarded, shall be resolved exclusively by the United States District Court or the appropriate Georgia State Court located in the City of Atlanta, Georgia; (iii) any and all claims, judgments and awards shall be limited to actual out-of-pocket costs incurred, including costs associated with entering this Contest, but in no event attorneys’ fees; and (iv) under no circumstances will participant be permitted to obtain awards for, and participant hereby waives all rights to claim punitive, incidental and consequential damages and any other damages, other than for actual out-of-pocket expenses, and any and all rights to have damages multiplied or otherwise increased. SOME JURISDICTIONS DO NOT ALLOW THE LIMITATIONS OR EXCLUSION OF LIABILITY FOR INCIDENTAL OR CONSEQUENTIAL DAMAGES, SO THE ABOVE MAY NOT APPLY TO YOU. All issues and questions concerning the construction, validity, interpretation and enforceability of these Official Rules, or the rights and obligations of the participant and Station in connection with the Contest, shall be governed by, and construed in accordance with, the laws of the State of Georgia, without giving effect to any choice of law or conflict of law rules (whether of the State of Georgia or any other jurisdiction), which would cause the application of the laws of any jurisdiction other than the State of Georgia. Nationwide Simultaneous Contest. THE CONTEST IS ONE (1) NATIONWIDE CONTEST MADE UP OF MANY PARTICIPATING STATIONS, AS OUTLINED IN EXHIBIT A, WHICH IS ATTACHED. STATION IS CONDUCTING THIS CONTEST CONCURRENTLY AND SIMULTANEOUSLY ON SEVERAL PARTICIPATING STATIONS (21 INDIVIDUAL RADIO STATIONS) THAT ARE LOCATED IN VARIOUS STATES AND THOSE RESPECTIVE VARIOUS TIME ZONES WHERE A STATION IS LOCATED. PARTICIPATING STATIONS MAY INDIVIDUALLY REFER TO THIS NATIONWIDE CONTEST IN VARYING WAYS AND BY VARYING NAMES DEPENDING ON A PARTICULAR STATION’S FORMAT AND WHAT A PARTICIPATING STATION DETERMINES TO SOUND MOST APPEALING TO A PARTICIPATING STATION(S)’ PARTICULAR AUDIENCE. BY PARTICIPATING, PARTICIPANT ACKNOWLEDGES THIS IS ONE (1) NATIONWIDE CONTEST WITH MANY PARTICIPATING STATIONS. Contest Results. A winners list may be obtained within thirty (30) days after the Contest Period expires by sending a self-addressed stamped envelope to the Station identified below, but prior to six (6) months after the Contest has concluded. AS REFERENCED IN THE OFFICIAL CONTEST RULES FOR THE CUMULUS MEDIA RADIO STATION GROUP NATIONWIDE CONTEST “Mariah Carey Fly Away” BELOW ARE THE 21 PARTICIPATING RADIO STATIONS THAT ARE ALL SIMULTANEOUSLY TAKING PART IN THIS NATIONWIDE CONTEST. A complete copy of these rules can be obtained at the offices of radio station 95.1 KBBY (“Station”), owned and operated by Cumulus Media Holdings Inc. or one of its subsidiary companies, 1376 Walter Street Suite #6 Ventura, CA 93003, during normal business hours Monday through Friday or by sending a self-addressed, stamped envelope to the above address. Contest Period. The Contest will begin at 10:01AM PT on February 19, 2018 and will run through 7:00PM PT on February 22, 2018 in two distinct time blocks, from 10:01AM PT to 2:00PM PT and/or 3:00PM PT to 7:00PM (the “Contest Period”). The Station’s computer is the official time keeping device for this Contest. On-Air: Listen to the Station weekdays from 10:01AM PT to 2:00PM PT on Tuesday February 19, 2018 and Thursday February 21, 2019, or 3:00PM PT to 7:00PM PT on Wednesday, February 20, 2018 and Friday, February 22, 2018 during the Contest Period. When the Station announcer, at random times during the Contest Period, asks for a specific numbered caller, listeners should call the Station Contest Line at (805) 656-9595. The correct numbered caller to the Station, as determined by the Station in its sole discretion, will win. Winner Selection. Station will select one (1) call-in contest winner per weekday in the aforementioned weekday time slots. Winners will be the correct numbered caller, as specified by the Station announcer. The winning entrant will be notified immediately by the on-air announcer. All winners are subject to verification of eligibility and compliance with the terms of these rules. Station’s decisions as to the administration and operation of the Contest and the selection of the potential winner are final and binding in all matters related to the Contest. Failure to respond to the initial verification contact within three (3) days of notification will result in disqualification. There will be a total of up to five (5) prizes awarded during the Contest. 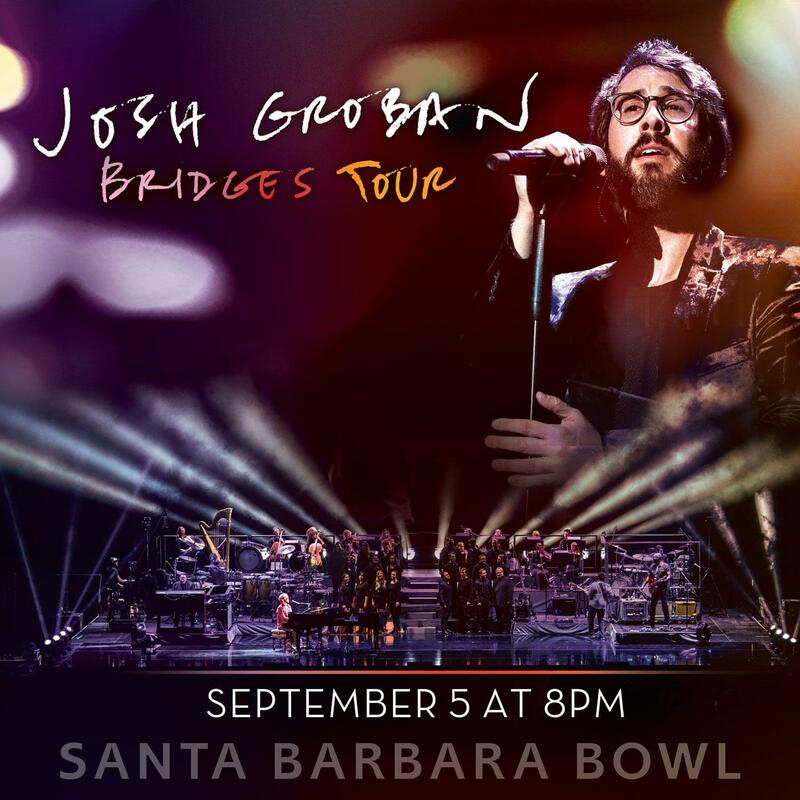 Each Prize will be two (2) tickets to the February 11, 2018 “Josh Groban Concert” at the Santa Barbara Bowl in Santa Barbara, located at 1122 N Milpas St, Santa Barbara, CA 93103. Tickets furnished by AEG/Goldenvoice. ARV of each prize is eighty-one dollars and fifty cents ($80.00). TICKETS ARE NON-TRANSFERABLE AND MAY NOT BE SOLD FOR ANY REASON. TICKETS SUBJECT TO CANCELLATION SHOULD A WINNER BE FOUND TO BE SELLING OR TRANSFERRING THE PRIZE. Winner is responsible for all taxes associated with prize receipt and/or use. Odds of winning the Prize depend on a number of factors including the number of eligible callers during the Contest Period and listeners participating at any given time. Cumulus Media Holdings Inc., 1376 Walter Street, Suite #6, Ventura, CA 93003. A complete copy of these rules can be obtained at the offices of radio station 95.1 KBBY (“Station”), owned and operated by Cumulus Media Holdings Inc. or one of its subsidiary companies,1376 Walter St. Ventura, Ca. 93003, during normal business hours Monday through Friday or by sending a self-addressed, stamped envelope to the above address. Contest Period. The Contest will begin at 10:01am PT through 2:00pm PT on February 14, 2019 and again at 3:00pm PT through 6:59pm PT on February 14, 2019 (the “Contest Period”). The Station’s computer is the official time keeping device for this Contest. (i) On-Air: Listen to the Station on February 14, 2019 from 10:01am PT through 6:59pm PT during the Contest Period. When the Station plays a song by the band Heart in its entirety, listeners should call the Station at 805-656-9595. Caller 9 to the Station, as determined by the Station in its sole discretion, will be the winner. Time Delay Between Over-the-Air Analog Signal and Internet Broadcast: Due to the time delay that exists between the Station’s analog over-the-air signal and the Station’s online webcast, listeners who listen to the Station online may hear the cue to call later than listeners listening to the Station’s analog over-the-air signal. As a result, the odds of an online listener entering this Contest on-air may be diminished. Prize: Five (5) prizes will be awarded in this Contest. Each prize is one (1) pair of general admission tickets (the winner and a guest) to see Heart at the Hollywood Bowl located at 2301 N Highland Ave, Los Angeles, CA 90068 on September 9, 2019 (ARV $80). Winner is responsible for all taxes associated with prize receipt and/or use. Odds of winning a prize depends on a number of factors including the number of eligible entries received during the Contest Period and listeners participating at any given time. Station reserves the right to substitute any listed prize for one of equal or greater value for any reason. This Contest is open only to legal U.S. residents age twenty-one (21) years or older at the time of entry with a valid Social Security number and who reside in the Station’s Designated Market Area (“DMA”) as defined by Nielsen Audio, who have not won a prize from the station in the last 90 days or a prize valued at $500 or more in the last 180 days, and whose immediate family members or household members have not won a prize from the station in the last 90 days or a prize valued at $500 or more in the last 180 days. Void where prohibited by law. Employees of Cumulus Media Holdings Inc., its parent company, affiliates, related entities and subsidiaries, promotional sponsors, prize providers, advertising agencies, other radio stations serving the Station’s DMA, and the immediate family members and household members of all such employees are not eligible to participate. The term “immediate family members” includes spouses, parents and step-parents, siblings and step-siblings, and children and stepchildren. The term “household members” refers to people who share the same residence at least three (3) months out of the year. The Contest is subject to all applicable federal, state and local laws and regulations. Participation constitutes entrant’s full and unconditional agreement to these Official Rules and Sponsor’s decisions, which are final and binding in all matters related to the Contest. Winning a prize is contingent upon fulfilling all requirements set forth herein. Contest Period. The Contest will begin at 6:01AM PT on October 19, 2018 and will run through 11:59PM PT on October 18, 2019. The Station’s computer is the official time keeping device for this Contest. Online: (i) Visit the Station’s website www.951kbby.com during the Contest Period, (ii) click on the “95.1 KBBY Birthday Club” Contest link, and (iii) complete an entry form. All entries must be received by 11:59 pm PT on October 18, 2019 to be eligible. 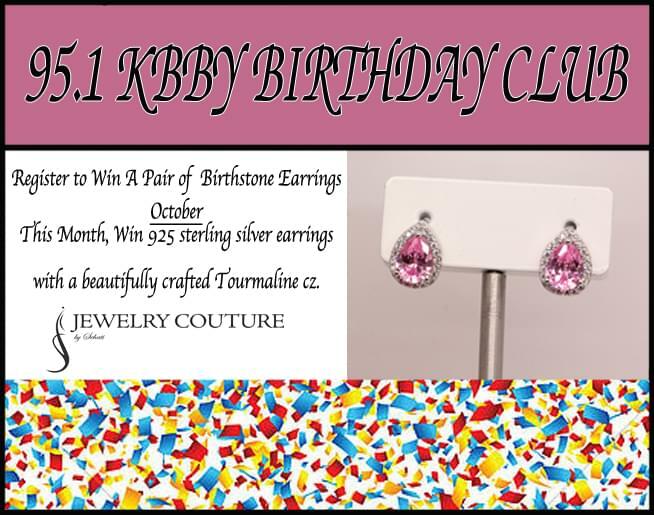 All registrations for previous versions of the 95.1 KBBY Birthday Club Contest expired when those contests ended. You must re-enter to be eligible for this specific Birthday Club Contest. Limit one (1) entry per person, per email address. Multiple participants are not permitted to share the same email address. Any attempt by any participant to submit more than one (1) entry per person by using multiple/different email addresses, identities, registrations and logins, or any other methods will void that entry and the participant may be disqualified. Use of any automated system to participate is prohibited and will result in disqualification. Station is not responsible for lost, late, incomplete, invalid, unintelligible, inappropriate or misdirected registrations, all of which will be disqualified. In the event of a dispute as to any registration, the authorized account holder of the email address used to register will be deemed to be the participant. The “authorized account holder” is the natural person assigned the telephone number by the wireless carrier or an email address by an Internet access provider, online service provider or other organization responsible for assigning email addresses for the domain associated with the submitted address. Potential winner may be required to show proof of being the authorized account holder. All entries become the sole and exclusive property of Station and will not be returned. Station reserves the right to contact entrants and all other individuals whose email address is submitted as part of this promotion. No mail-in entries will be accepted. Winner Selection. On or about 10:00AM PT on the last Friday of each month during the Contest Period, excluding Federal holidays when the station will instead make its selection on the last Thursday of the month, Station will select one (1) entry to win our Monthly Grand Prize, in a random drawing from among all valid Contest Entry Forms received by Station on their website up to that point in time during the Contest Period. The winning entrant will be contacted using the email address and/or telephone number provided with the entry and may be awarded the prize (subject to verification of eligibility and compliance with the terms of these rules).Station’s decisions as to the administration and operation of the Contest and the selection of the potential winner are final and binding in all matters related to the Contest. Failure to respond to the initial verification contact within three (3) days of notification will result in disqualification. 5 Verification of Potential Winner. THE ELIGIBILITY OF POTENTIAL CONTEST WINNERS IS SUBJECT TO VERIFICATION BY STATION WHOSE DECISIONS ARE FINAL AND BINDING IN ALL MATTERS RELATED TO THE CONTEST. The potential winner must continue to comply with all terms and conditions of these Official Rules, and winning is contingent upon fulfilling all requirements. The potential winner may be notified by email and/or telephone call when to pick up their prize. The potential winner will be required to sign and return to Station, within one (1) day of the date notice is sent, an affidavit of eligibility and a liability/publicity release (except where prohibited) in order to claim his/her prize. Winner’s partner must also sign a liability/publicity release (except where prohibited) in order for winner to claim his/her prize. A winner who returns the affidavit of eligibility and liability/publicity release will be deemed to have accepted the contest prize and thereafter will not be permitted to rescind their acceptance of the prize and/or return the prize. If a potential winner cannot be contacted, fails to sign and return the affidavit of eligibility and/or the liability/publicity release within the required time period (if applicable), or if the prize or prize notification is returned as undeliverable, potential winner forfeits prize. In the event that the potential winner of a prize is disqualified for any reason, Station may award the applicable prize to an alternate winner by random drawing from among all remaining eligible entries. listed prize for one of equal or greater value for any reason. March 2019 925 sterling silver earrings with a beautifully crafted Aquamarine cz. April 2019 925 sterling silver earrings with a beautifully crafted Diamond cz. May 2019 925 sterling silver earrings with a beautifully crafted Emerald cz. June 2019 925 sterling silver earrings with a beautifully crafted Alexandrite cz. July 2019 925 sterling silver earrings with a beautifully crafted Ruby cz. August 2019 925 sterling silver earrings with a beautifully crafted Peridot cz. September 2019 925 sterling silver earrings with a beautifully crafted Sapphire cz. October 2018 925 sterling silver earrings with a beautifully crafted Tourmaline cz. November 2018 925 sterling silver earrings with a beautifully crafted Citrine cz. December 2018 925 sterling silver earrings with a beautifully crafted Blue Topaz cz. relating to an entrant’s participation in the Contest and/or entrant’s acceptance, use, non-use or misuse of the prize. iii. represent and warrant that: you have the full legal right, power and authority to grant to the Station the license provided for herein; you own or control the complete exhibition and other rights to the Materials you submitted for the purposes contemplated in this license; you are either the parent (or legal guardian) of any minor featured in the Materials or have received the express consent of the parent (or legal guardian) for any such minor to appear in the Materials and to enter the minor’s likeness in the Materials in the contest; and neither the Materials nor the exercise of the rights granted herein shall infringe upon or violate the right of privacy or right of publicity of, or constitute a libel or slander against, or violate any common law or any other right of, any person or entity. transmission, communications line failure, theft or destruction or unauthorized access to Station’s website. self-addressed stamped envelope to the Station identified below.